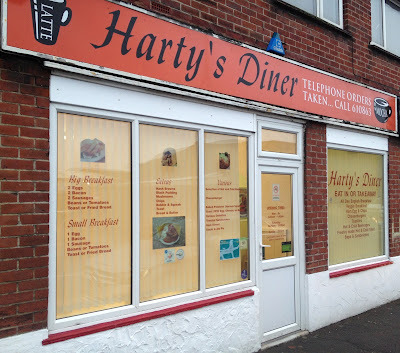 I discovered the amazing breakfast at Harty's Diner back in September 2010, it still remains one of my favourite places so I decided to write a more up to date review. 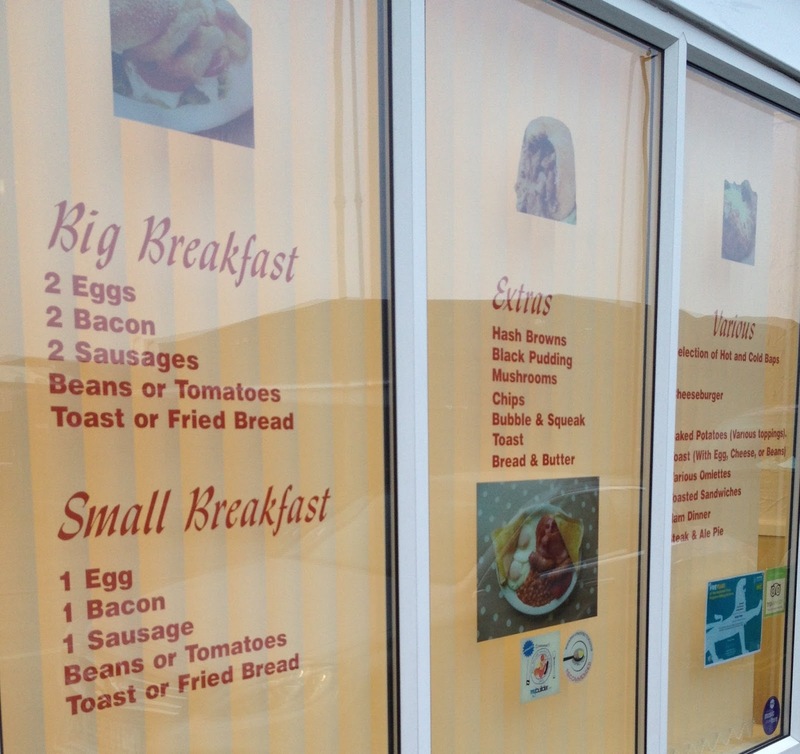 The big breakfast costs £5.70, the small breakfast £4.20 and extras are 90p each. 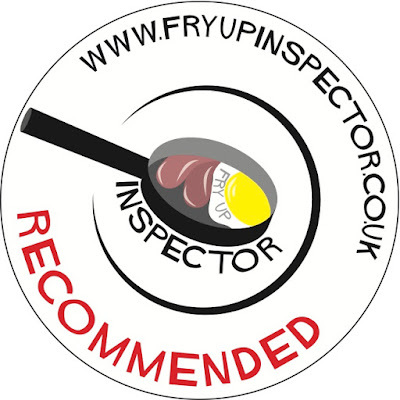 They were recently awarded the five year certificate for consistently achieving a five star rating of food hygiene. This is the main seating area, through the archway by the door is another more secluded area. The interior is well lit and nicely laid out, a great place to sit and enjoy a spot of breakfast. Squeezy sauce bottles, condiments and a classic sugar dispenser can be found on each table. A coffee here costs just £1.50. I ordered the big breakfast with black pudding and mushrooms as extras, it comes with bread and butter too. This is a real working man's breakfast that tastes superb and always looks great when it arrives, I love this breakfast! The bacon ended up between these fluffy white slices of bread, delicious! I do love tinned tomatoes and they go perfectly with this breakfast, great mushrooms too. Nice plump sausages and juicy bacon. A nice slice of black pudding and beans. You can choose between beans or tomatoes but they are always happy to serve half and half, an option I always go for. The eggs and fried bread are always presented this way here, the tell tale sign of a Harty's breakfast! Crispy golden fried bread and nice runny yolks. Now thats a nice brekko, the fried bread looks absolutely perfect. I'd like to see what their bubble is like. Their homemade bubble is really nice, I tried it on a previous visit. Ah right, one for the note book then. 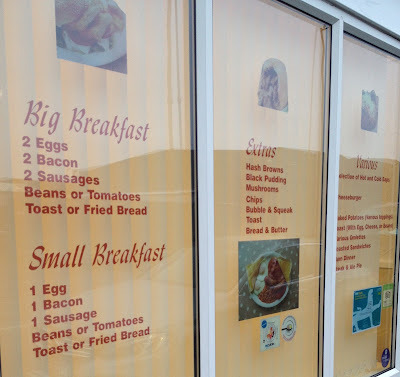 I don't know what the capabilities of blogspot.com are, whether you can do polls or not, but if you can then there might be some interest in trying to find out what IS the perfect breakfast. I know you've said that you just mark things as you find them based on your own opinions, and that's obviously fair enough - but are you looking for THE perfect breakfast? :) As an example, and yes, a sample size of 1, I'd always take scrambled over fried, tomatoes over beans, and I detest undercooked breakfast meats. Sausages should be browned all over, and bacon crisp. Just an idea, as I say. I know a few forums which I use will allow user polls, but as I said at the start, I have no idea of the capabilities of blogspot. 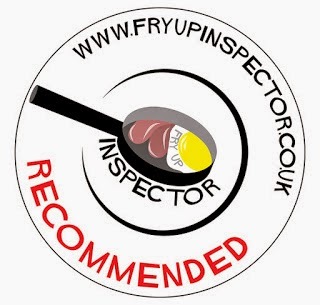 Although I started the blog as my search for the perfect breakfast, I have discovered on my journey that there are different styles of breakfasts that I now enjoy, because of this it's difficult to pin down the perfect breakfast. For example on a builders breakfast in a traditional cafe I prefer tinned tomatoes but in a cafe/bar type place I prefer vine ripened. Although the scores still remain I feel the blog has become more of an informative resource for anyone trying to find out information on a particular place I've visited. I like the poll idea though, maybe something I can use on my facebook page to get peoples opinions, cheers! Went to Harty's on Saturday following your recommendation. It was full when I got there but worth the wait, wish I had tried the bubble but everything else was lovely anyway.